A wealth of essential facts in the Q-and-A format that you want! This app is the ideal way to sharpen your skills and prepare for exams. The starter pack for each subject includes 25 questions and detailed explanations derived from McGraw-Hill’s 500 College Questions Series. The remaining questions that complete each set of 500 questions per subject require an in-app purchase of $6.99. 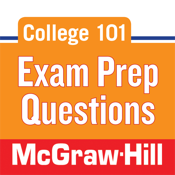 Get the question-and-answer practice you need with McGraw-Hill's 500 Questions to Know by Test Day. Organized for easy reference and intensive practice, the questions cover all essential college topics and include detailed answer explanations. The 500 practice questions are similar to course exam questions so you will know what to expect on test day. Each question includes a fully detailed answer that puts the subject in context. This additional practice helps you build your knowledge, strengthen test-taking skills, and build confidence. Our dynamic College 101 app makes it easy to keep up with your studies amid all the usual distractions of college life. With two study modes - Browse and Quiz, you will quickly discover your strengths and can easily target your weaknesses. Use the Browse mode to review the material and flag any problem areas. Switch to the timed Quiz mode to test your knowledge. Detailed analytics will paint a comprehensive picture of what you know and how well you know it. Want to share your progress with friends? If you're a Facebook user, you'll be pleased to know that College 101 allows you access to your Facebook account as well as the gWhiz fan page. So, wherever and whenever you use the app, you can stay connected and share your thoughts about this app (or anything else) with your friends. So download College 101 today. Your professors and parents will thank you.